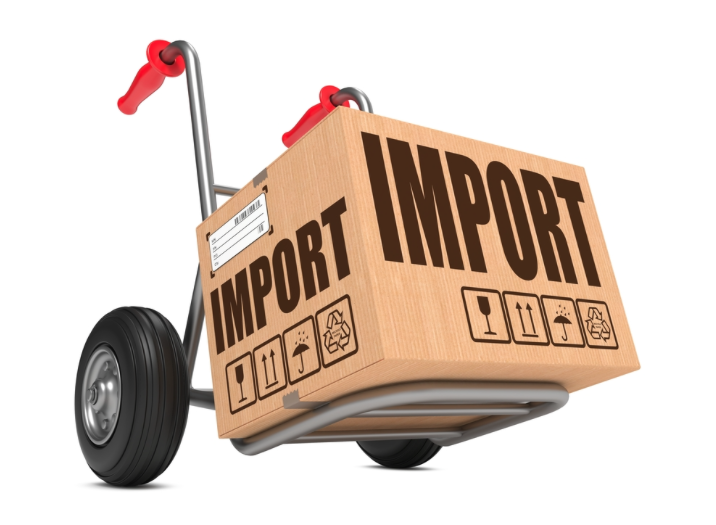 Also included in import rate hikes are antimalarial and antibiotics drugs. The rate hikes are designed to support import substitution policies by the government and also raise revenues. By taxing imported rice and sugar for instance, the hope is that imported commodities becomes more expensive and thus demand shifts to local rice substitutes boosting local production and sale of rice and creating local jobs. Import substitution works where there is a local “substitute” that can take up the fall in supply of imported brands when their costs go up. Lets take rice, local production of rice cannot meet local demand, thus if you tax rice imports, the price of rice imports will go up. 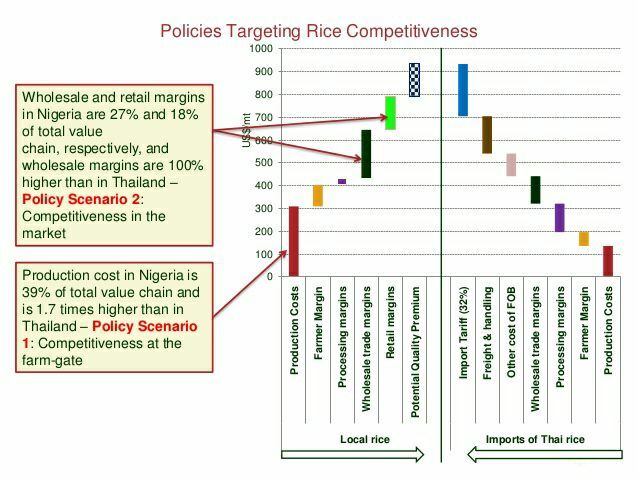 thus the prices of local rice will also go up as demand shifts to local rice, solidify food inflation. To reduce local prices, local production has to go up. The government efforts at import substitution should thus focus on the local commodities value chain with a strategic goal of boosting harvests, processing and availability of local substitutes. Once production is up, and cheaper local substitutes is available in the market, imports will drop, prices will fall. Taxing imports without a corresponding local substitute is counter intuitive. 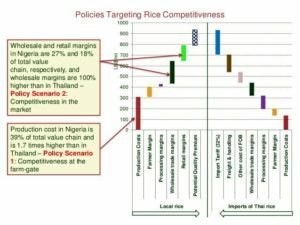 So the question the economic team must address is why rice can be exported from say Thailand, with international freight and insurance paid, distributed in Nigeria and yet be cheaper than Kebbi and Anambra produced rice. so what is the rationale of imposing tariffs on imported sugar when according to the National Sugar Development Council report in 2010 put local production capacity of 0.03 MMT or 2% of local demand then put at 1.41 MMT? A report by the ThisDay Newspapers in March 2016 reviewed the performance of three sugar importers (Dangote, BUA and Flour Mills) who signed an agreement with the FGN to backward integrate their sugar value chains, with a goal of producing 1.797MMT to meet total local demand and halting import. At the date of the article only Dangote was producing with a projected output of just 18000 metric tones. so why increase import tariffs? when local production is nowhere near meeting local demand. A way forward is a massive investment in of key rural agriculture zones. Agriculture in Nigeria is still manual and rain fed, transport of harvest to key markets is still sub-optimal and inefficient….modern storage infrastructure are insufficient, commodity markets nonexistent, all these must be addressed. To boost local production…the Federal and State governments have to coordinate better with specific responsibilities.There has to be a firm strategic handshake between Ministries of the Federal government, for instance, take rice, Works and Power Ministry should build rural access roads and power schemes to facilitate local processing, Agriculture Ministry provides improved seeds, Finance Ministry creates a private sector run commodities exchange and Private Equity funding for rice mils, Transport Ministry links Kebbi rice markets by rail to the rail grid, Water Ministry secures irrigation assets etc these direct intervention drops local costs and support the sector, improving yield, only then can the Trade Ministry imposes tariffs on imported rice. in Summary, we have to take a strategic view, taxes on imports means alone wont do it.